If you’re curious about all things Google+, you’re in luck. The project’s technical lead, Google (s GOOG) engineer Joseph Smarr, is currently hosting an online question and answer session about the service — and he has already shared a number of details about Google+’s development, technology, and plans for the future. On Monday, Smarr opened himself up for questions on Q&A website AnyAsq.com, a Y-Combinator-backed site reminiscent of Formspring.me where users can invite others to “ask me anything.” People sign in to post questions on AnyAsq through their Twitter accounts, but a host’s responses can be longer than 140 characters. Although none of Smarr’s responses have been shockingly revealing, the AnyAsq activity is just the latest example of how Google has worked hard to project an air of openness throughout the entire Google+ launch. Where the now-defunct Google Wave was developed with an air of secrecy that ultimately confused users as to its purpose, Google’s strategy with the Plus project has been one of transparency and agility — a “done is better than perfect” attitude. So far, it’s been a refreshing approach. The challenge for the future will be maintaining that flexibility as Google+ grows. I want Google to guarantee that Google+ data will not be indexed and made available world-wide for anyone to search on and find; it goes to individual preference and PRIVACY! Earn cash for each visitor to your Google Plus links with http://Gooplu.com Google Plus Shortener – make short URL for Google+ and make money. Himanshu. Thank you for the invite. I’ve seen these circles before. Don’t remember the name of the application anymore. So, is the backend primarily written in Python, Java, or C++? What database engine do they use, MySQL? What operating system, Linux (what distro)? What about the web server, is it GWS? All the Flashing UI(Animation) like.. Adding in to circles e.t.c are written using HTML5 instead of Adobe stuff ? I am on Google+. I still need to see Google+ in action. As of now, it looks empty with friends invited and action to come. I want to see Venn diagrams (a person in more than one circle). I am really not sure of the purpose of these circles. Once I know, I may change my mind. Thank you for being willing to send me an invite. My email address is: epoortvliet@gmail.com. I’m curious about Goolgle+. Can’t wait to use it. Erik – I have sent you invitation. Hi Himanshu, Would love to receive an invite if youd be willing to do so. Anxious to get a google+ acct. Ken-What’s your email id? You may send a message on my site – contact us or on my mail id in about page. Pretty Nice Info, do more with new g+ extensions for Google + take a look at my site. Gagan – Thank you for giving info on those plugins. It will still take time for Google+ to catch facebook. Latency? Wouldn’t you want that to be really low? I like Google wave conceptually but so few people use it that it is effectively useless. Marketing is as important as a good product. Google will have to make Google+ really smart to beat Facebook. Did you get an invite? Do you want to invite me? Erik – I got the invite. I can invite you but I don’t know your email id. Can you send me an email from my profile on my website? I noticed that Google+ does not let you add anyone in your circle by searching from email id. It however lets you search using name – bad. That’s great news. My email-adress is epoortvliet@gmail.com. It’s funny that all this secrecy would have been mentioned as a key thing if it were an Apple product! I think this time Google is very serious. They can’t afford another Orkut or Google Wave. I think Google is right on track in keeping its plans for Google+ open and transparent. Keeping the communication lines open would help Google market the new social networking site better and come up with solutions as the needs arise. That being said, Google should continue to focus on the integration and aesthetics, if I may say, of Google+ for it to compete with Facebook. We’ve seen the likes of Wave, Orkut, and others go down unnoticed. Agree that the assessment is misleading and in my opinion flawed – that there was secrecy behind google Wave and it was a factor in its failure. Google Wave didn’t really give all that compelling reasons to its users to join and not sure Google+ does either. What gaps in facebook is Google trying to address ? and are they compelling enough ? I see 100 questions (determined by search for word “tweet” which appears with each Q&A pair) and no “next” page. Perhaps the “270” number quoted was the number of times the thread was voted up? Or I’m missing hundreds of Q&A. Either way good stuff! Thanks for the heads up! Now, if only they could make the desktop site (?fd=1) work on iPad. It displays, but you cannot interract with it The mobile site which comes up with the redirect works but is really awful. Facebook has one up here as their full site works well on iPad. Shame as I like the Google+ desktop site and the product. This just gives me a reason to you use it. Works great on Android devices. Get something more useful! 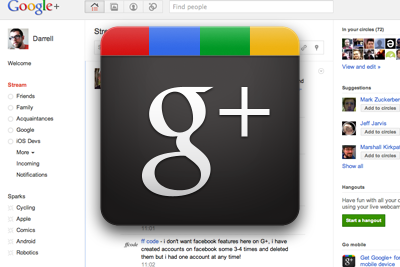 Still wish I could my google apps account on G+…. Objection! Not only is the above statement factually incorrect about the ‘air of secrecy’ around Google Wave development, it is also quite misleading in its assertion that such alleged secrecy led to the confusion in users to its purpose. EXTREMELY disappointed to read this statement on Gigaom! Thanks for the feedback A S.
In my opinion, Google did not provide as much straightforward information about Wave as they have about other products. Wave’s marketing strategy seemed to rely partly on using mystery (aka, secrecy) to build hype. For now, Google+ seems to be taking a different tack. Happy to hear more of your opinion, though. I’d have to agree with A S on this. With Wave, Google published the Google Wave Federation Protocol and even open sourced significant portions of their implementation of the Wave servers. It doesn’t get any more open than that. Google+ has had a much more public launch yet the APIs are not ready.